Wednesday night after work, Cinecultist walked uptown with our co-worker Josh and discussed CC's plan of taking in something craptacular cinema to unwind from a long day. After parting at St. Mark's, Cinecultist grabbed a tasty steak burrito from the closest Chipotle and headed over to the Village East to a 8 pm screening of Casanova. A cheap dinner and a movie date with ourselves, if you will. The movie is set in Venice, Italy during the 18th century but everything is so darn tootin' clean. We're not talking just about the people or the houses -- the canal is a crystal clear green. The Venice canal! 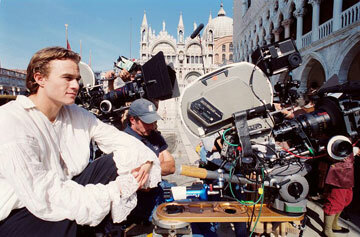 In one scene, they throw Heath Ledger's Giacomo Casanova in prison and even the prison is spotless. The walls are so pristine, you could lick them. Don't know why you'd be licking a prison wall, but still. Nary a touch of mold or dank or anything interesting in the whole place, or the movie for that matter. Casanova has no dank. That's our problem with it. In a nutshell of course. *You realize that if this pic, and pretty much everything in the theaters during January and February, was any good at all it would've come out before the Oscar eligibility cut-off on December 31, right? Okay. Good, we're all on the same page.